Sue and I had stopped for fuel on Sunday morning when suddenly the air was ripped and torn apart by the sound of motorcycle exhausts but not quite the exhausts on your standard two-wheeled motorcycle transport. A group of bikers on trikes had pulled into the filling station and a glorious noise those engines made too. Here are two of them and I know in these politically correct times I shouldn't race to conclusions but assuming his and hers on these two machines seemed a reasonable deduction. There was one conventional bike in the group, a Harley Davidson with an Akropovic exhaust and that sound like a piston engined fighter plane when the rider started it up. Fantastic. I hope that they all had a great trip to the seaside and enjoyed their fish and chips and ice creams because we enjoyed their bikes. Both of these trikes were sporting the 'Help for Heroes' flag in support of our servicemen and women, so more power to their collective throttle hands. John some of those Harley's can open one's ears. lovely to see they are flying the poppies, I have to take my hat off to most bikers they all adorn the bikes / clothes with some sort poppy to remember the dead. The front lawn got its first cut this last weekend and during the last week or so these little violets have appeared. They've never shown themselves before so we can only assume that they have arrived via bird droppings and already they are proving attractive to the bees so they're doing some good in their own small way. A neighbour said 'dig them out' but I've decided to just leave them as they are. Obviously they'll get cut when the mower goes over them but hopefully that will simply enrage them enough to flower again and there's even a couple of white ones somewhere in there too. Now to check how the plum blossom is coming on in the orchard. A somewhat different English Country Garden and certainly not one that people would associate with the typical vision of 'a country garden'. This one is a sort of tableau that is part antique shop, part dereliction and I suppose in modern speak 'de-constructed'. Parts of the garden are nearly cultivated and do-it-yourself is in evidence everywhere using found materials. The over-riding idea in the concept in the garden is, if it's interesting it'll fit it in somewhere. So the gardener has simply done precisely that. What intrigues us is that with all of the vases, plates and glassware that it hasn't attracted the opportunistic target shooter. Mind you perhaps the local creative shooters know what they would get in return if they did. As we always say, 'god bless the eccentrics of this world' particularly those in Norfolk and more power the their collective elbows. 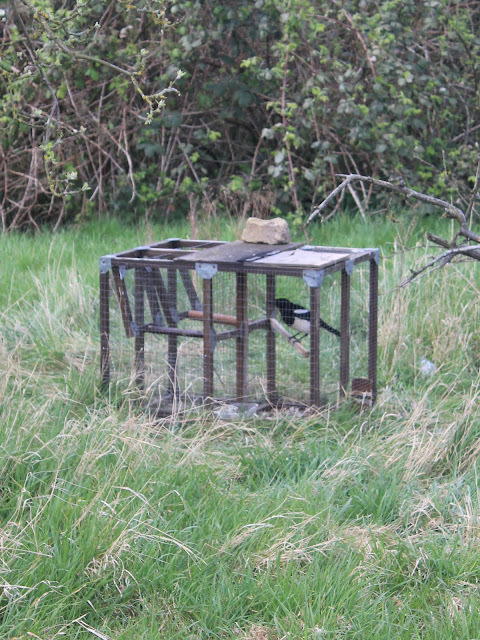 While wandering through an orchard that hosts a game shoot in season the two Jack rule Terriers got all excited about this, a Larsen Trap with the attractor, in this case a magpie set-up and ready to go. The next morning the trap had gone so the gamekeeper had, quite sensibly, moved the apparatus on to another area being marked out as territory and a nesting site. Later this month the keeper will be tracking the Carrion Crows having reduced the breeding population of magpies before they start laying their eggs. The songbirds and game birds in the orchard now have a bit more of a chance of raising a brood of chicks thanks to the inventive genius and scientific mind of a Danish gamekeeper called Larsen. Strangely the two terriers got all excited about the decoy and walked away and recommenced their prime directive, rat hunting. Headline news in the village but was it an error of judgement, plain stupidity or trying to hide something? 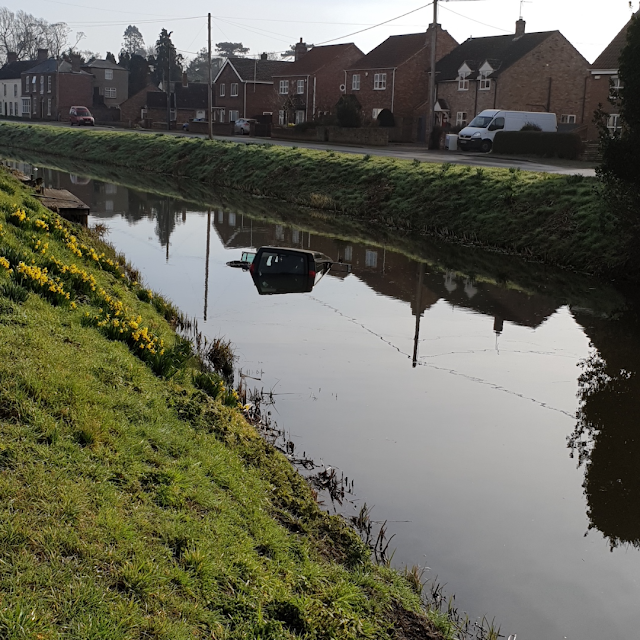 A Land Rover Discovery ended up in the river in the village although it didn't quite disappear under the surface and amazingly nobody saw or heard a thing. Nobody came forward to claim the vehicle or plead guilty to driving into the river so we all surmised that it was untaxed and uninsured and somebody was simply trying to dispose of it. An expensive loss though, a local haulage company lifted the 4x4 out of the water and took it to their secure truck park but the owner still hasn't come forward to claim their vehicle. Now it's being broken up for spares to cover the retrieval and rescue costs, no doubt the sum of the parts are far greater than the value of the whole vehicle.